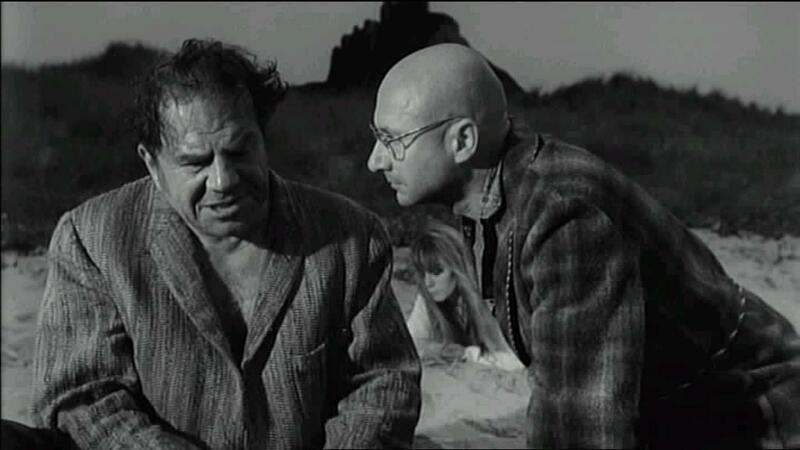 Two wounded gangsters (Lionel Stander and Jack MacGowan) seek refuge at the remote castle of a newly married couple (Donald Pleasence and Francoise Dorleac). 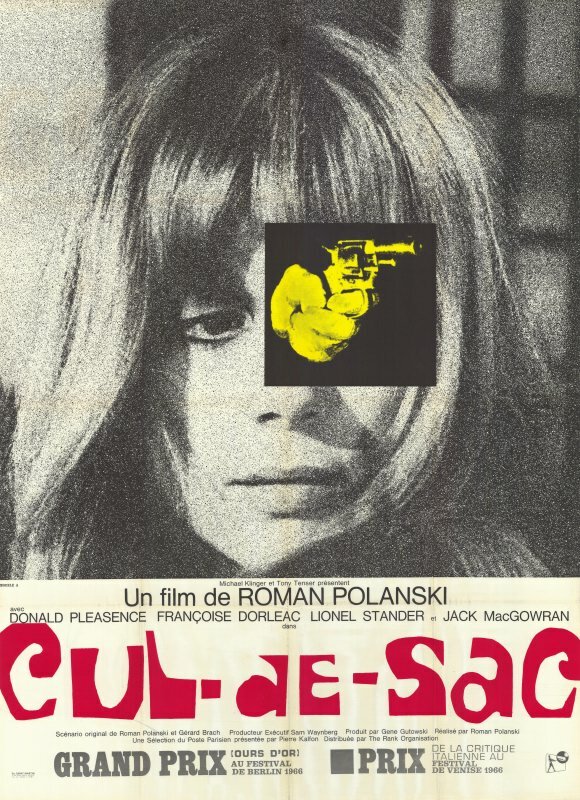 This unusual black comedy — Roman Polanski’s follow-up to Repulsion (1965) — stars American character actor Lionel Stander, a young Donald Pleasence, and Catherine Deneuve’s ill-fated sister, Francoise Dorleac (who died in an automobile accident the following year). Like Repulsion, Cul-de-sac clearly shows Polanski’s genius for hitting hard where we’re most vulnerable — he spares nothing in his depiction of a weak-willed man (Pleasence) who is literally emasculated at every turn, from his wife’s insistence that he dress up in her nightgown, to his inability to protect his own home — his “castle” — from invading gangsters. For the first 15 minutes of the movie, we don’t know who any of these characters are, or how they’ve ended up at such a remote location. 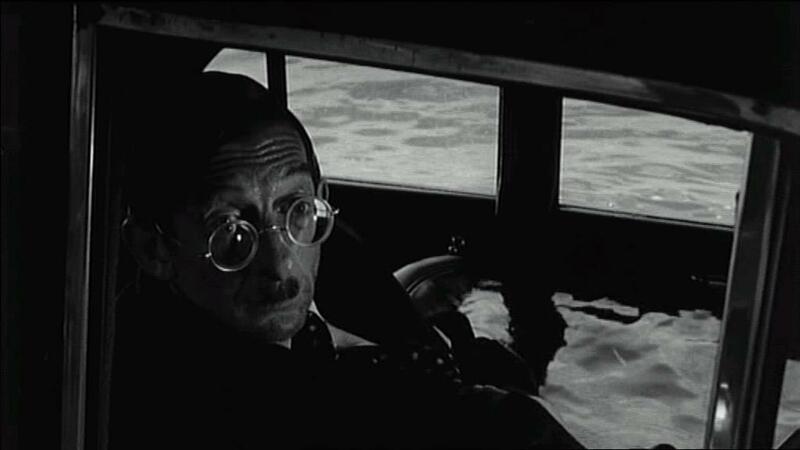 Yet this simply makes the bizarre imagery (bug-eyed MacGowan stuck in a car surrounded by high tide; Pleasence opening his refrigerator door to find nothing but cartons upon cartons of eggs) that much more intriguing. Eventually we succumb to the movie’s odd logic, and recognize that Stander’s gravelly gangster is a catalyst who will force Pleasence to confront his own insecurities, and disrupt the couple’s tenuous status quo. Cul-de-sac ultimately isn’t for every taste, and will be most satisfying for those who enjoy their cup of humor bitterly dark. Yet it’s finely photographed, well-acted, and possesses countless memorable scenes. Regardless of how much you actually enjoy it, this unique film is guaranteed to stick in your mind long after it’s over. Yes, as one of Polanski’s quirkiest films. Peary votes for it as the best movie of 1966 in his Alternate Oscars book (with no runners-up), and lists it as both a Cult Movie and a Personal Recommendation in his GFTFF. Even though Polanski is one of my favorite directors – and even though I’ve seen this a few times, I’ve never liked it. I will say it’s superbly shot – for what that’s worth. However, it seems that, having just made the terrific ‘Repulsion’, Polanski wanted to keep his hand in, continue perfecting his craft, while thinking up a better project (which would be ‘The Fearless Vampire Killers’). In ‘Cul-de-sac’, he simply has nothing to say and the actual film seems an incidental – an excuse to sharpen the mechanics of filmmaking. One soon assumes the intent here is black comedy but this is never capitalized on. The situation is static and screaming for dramatic value. The script is so thin that various bits of frou-frou are tacked on (MacGowran looking and mugging vaguely like Hitler; Pleasance placed in drag to look like an undernourished Divine; a group visit which is ultimately pointless). An extremely frustrating and taxing film.